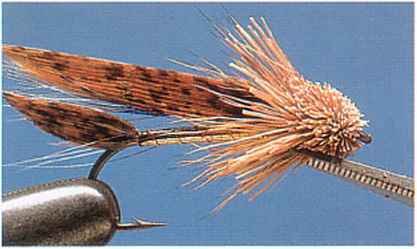 This is the original Don Gapen pattern that spawned, literally, thousands of flies that now carry the Muddler appellation. 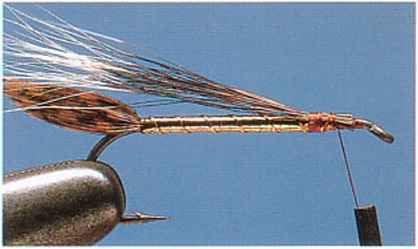 First designed to imitate a small bottom-dwelling fish, Muddlers are now tied as general attractor patterns and to imitate anything from caddis flies to grasshoppers. 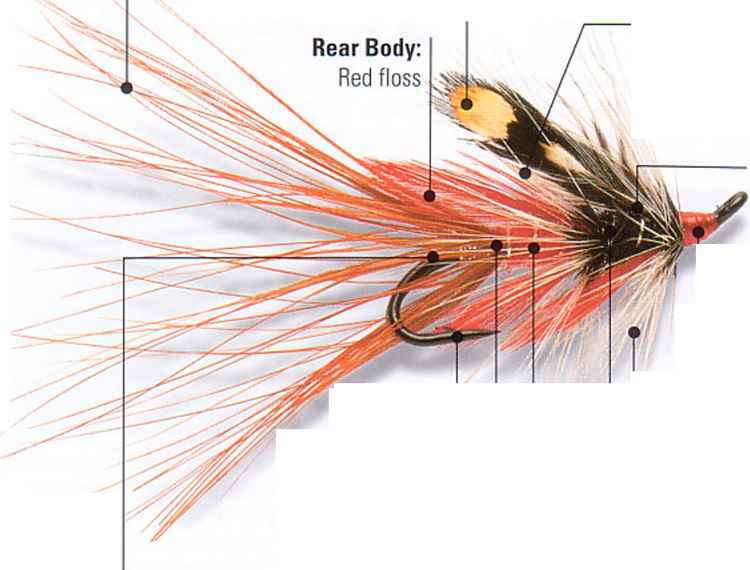 While each Muddler may differ in color and profile, all have the same basis in their construction: the spinning and clipping of deer hair to create a buoyant head or body. 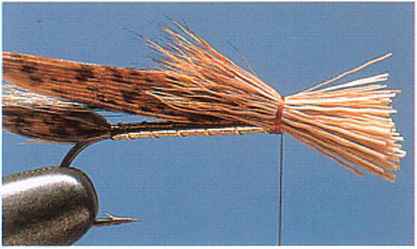 Being hollow and easily compressed, deer hair can be flared on the hook to form a ruff. By adding more bunches and compacting them, the hair is made dense enough to be shaped by trimming with scissors or a blade. 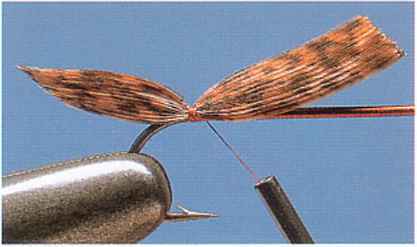 When tying Muddlers it pays to use a strong thread that allows plenty of pressure to be applied to the hair. 5 Cut a good bunch of deer hair from the skin. /? Pull the thread tight. 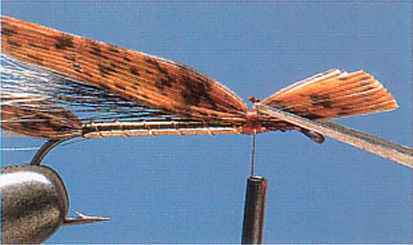 This will cause the hair Place the hair on top of the hook so that the O to flare around the hook, producing a collar and tips lie back along the wing. Wind on two or three the base of the Muddler head. Add further bunches loose turns of tying thread. of deer hair in this way until the eye is reached. Cast off the thread and trim the head to shape. 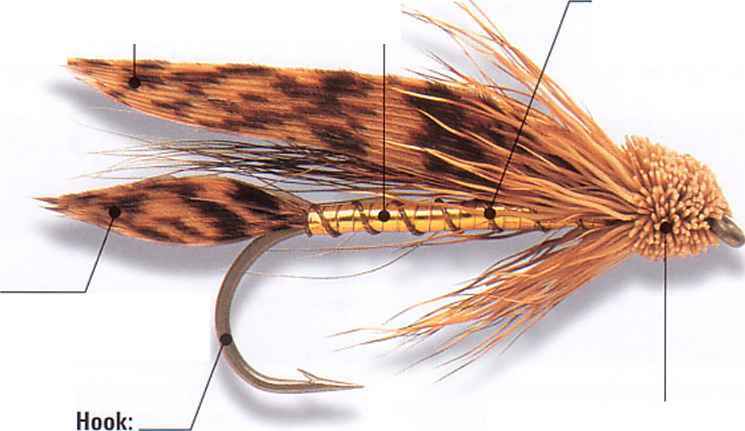 What turkey feather is used to tie a muddler minnow?